We had a flying visit to Istanbul last weekend; packed with family and friends to see, my niece’s beautiful wedding and delicious Turkish food to savor; every minute of it was special. 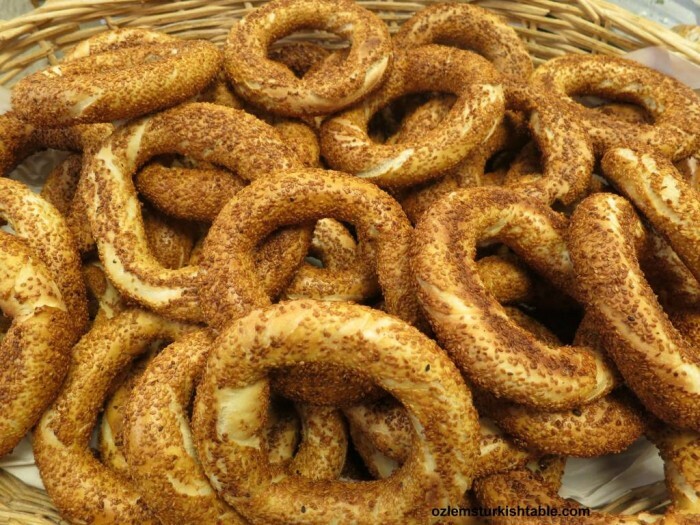 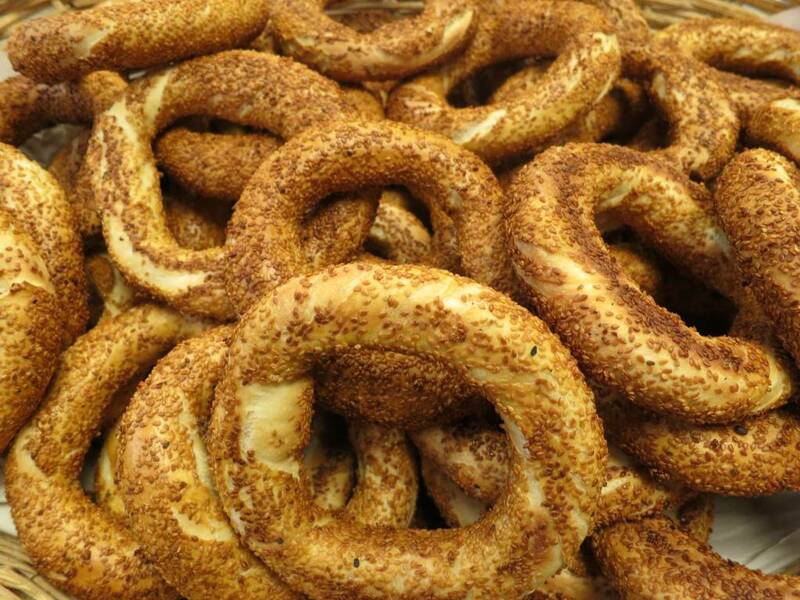 And what better greeting than of seeing Simit, Turkish sesame coated bread rings upon arrival, a very warm welcome that I couldn’t resist. 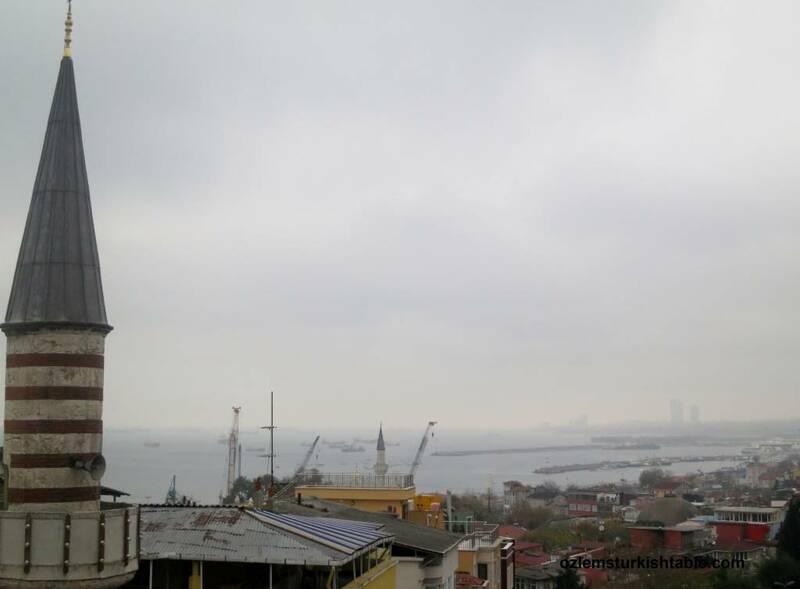 My dear sister Oznur and fellow blogger Senior Dogs Abroad timely informed me that the Yenikapi Metro train line is now connected to the Istanbul Ataturk Airport. 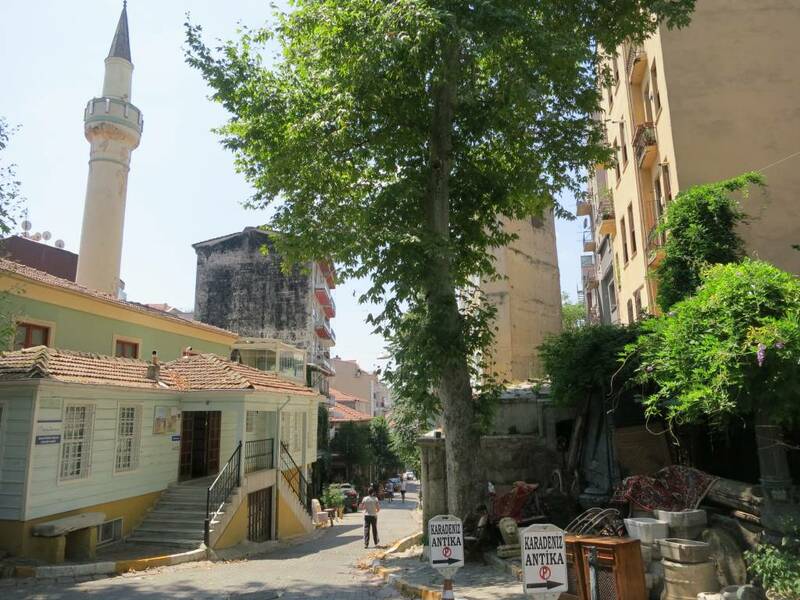 It’s indeed joyful news; we took the metro train line from the airport all the way to 4th Levent – a seamless, smooth journey just over 1 hour and great value. 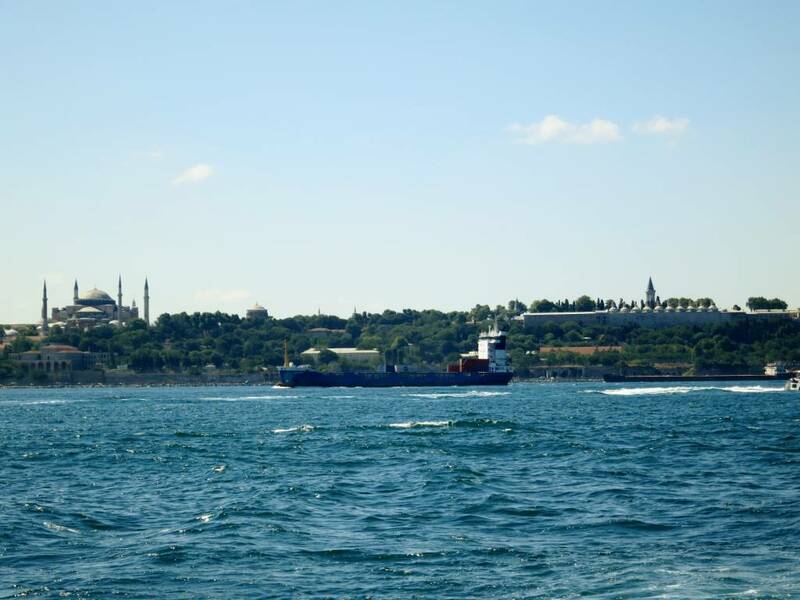 I highly recommend using the Metro train line from Ataturk Airport to all the way to Taksim and beyond. 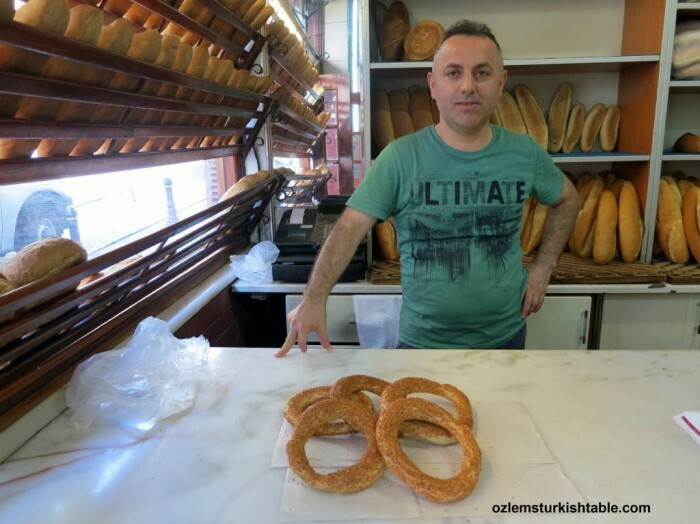 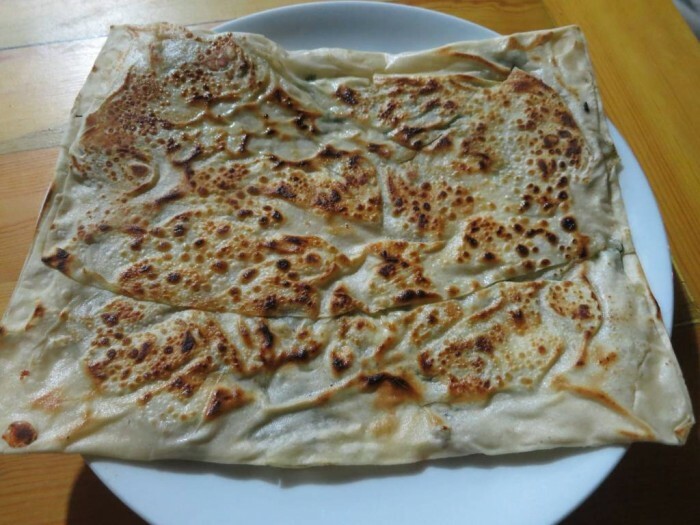 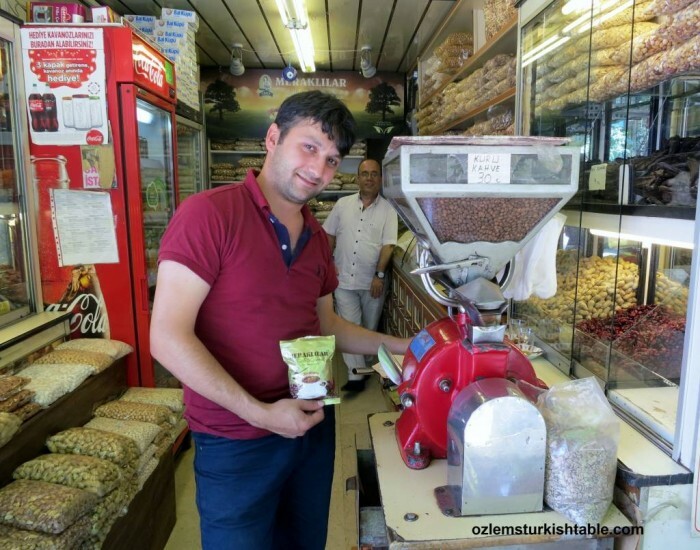 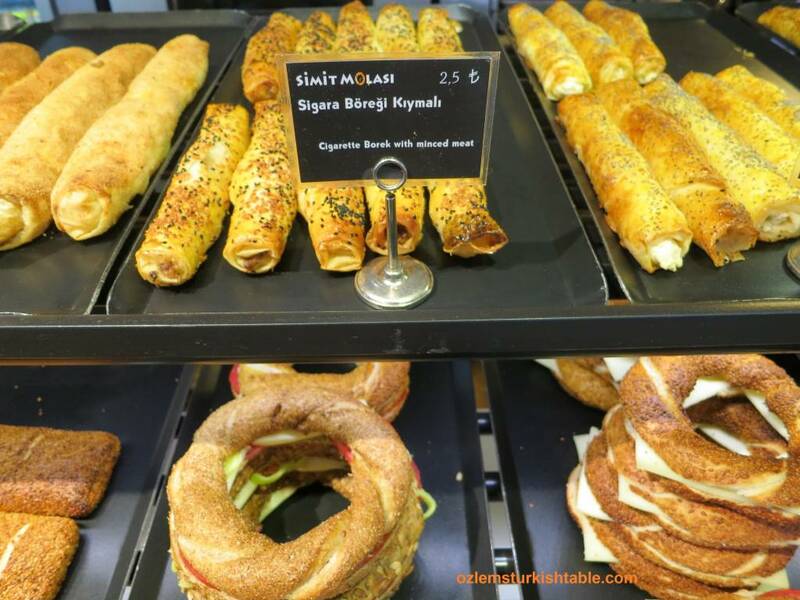 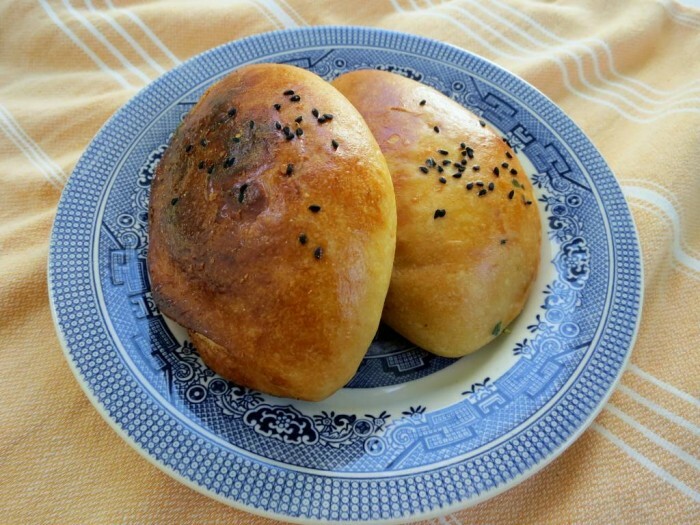 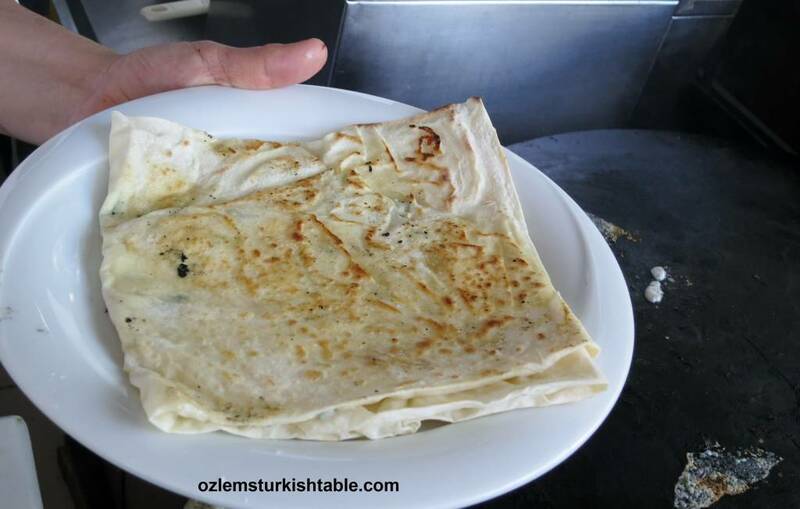 Just before I departed for Istanbul, I got a note from a reader, Chris, asking if I can visit Kofteci Huseyin in Beyoglu – Istanbul (address: Sehit Muhtar Mah. 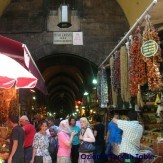 Kurabiye Sok, Akgun Is Hani, 14/A – Beyoglu – Istanbul). Apparently he had one of the best koftes, Turkish meatballs there and the tomato based sauce served with the meatballs there was just amazing. 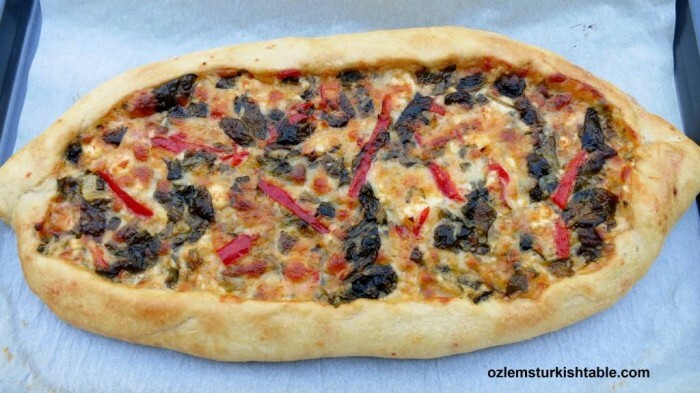 Well, I had a packed schedule but now was so curious about Kofteci Huseyin that I had to make it and so glad I did. Tucked behind Beyoglu, Kofteci Huseyin is a tiny lokanta, serving the very best Turkish meatballs with fasulye piyazi, Turkish bean salad with onions, since 1958. 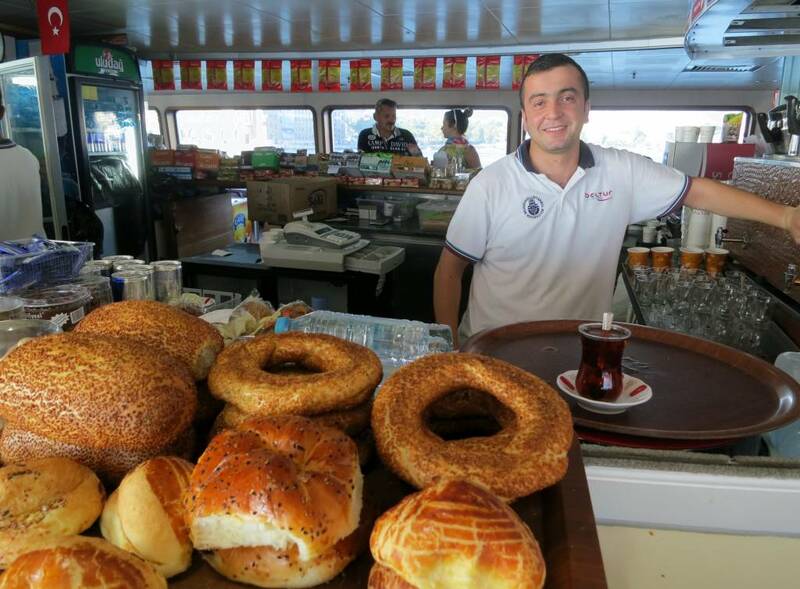 You are greeted with a warm smile and your koftes are made to order in front of you and served with freshly baked somun ekmek, Turkish bread with piyaz. 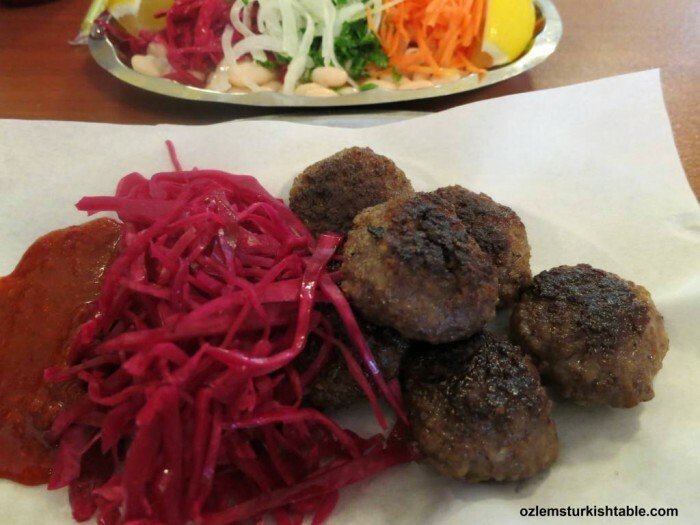 You can tell they are passionate about their kofte; sourcing out their meat from local butchers, prepared lovingly. 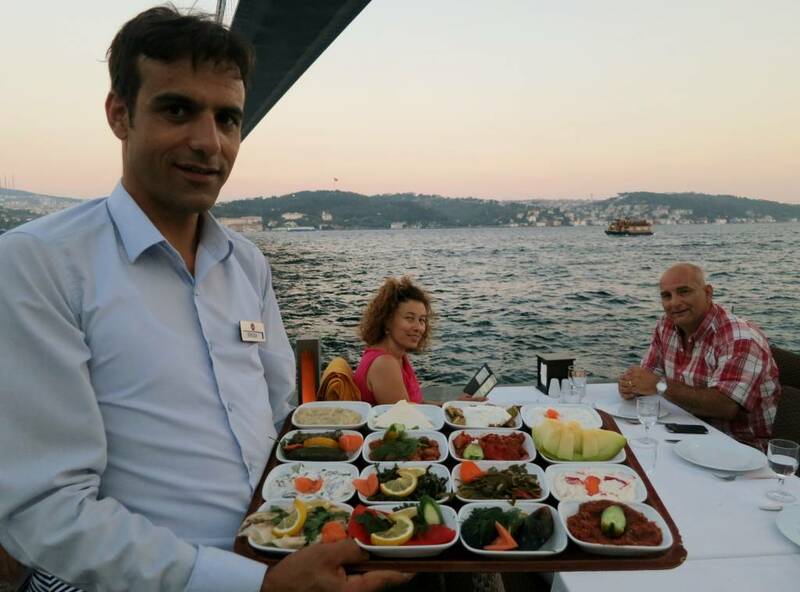 Kofteci Huseyin says “They ask me why I don’t serve soup or desserts; making kofte is what I do best and that’s our specialty. Every day we make kofte out of 40 kg of minced (ground beef), onion and bread crumbs and once the meat is finished, our job is finished for the day too, around 4 pm. 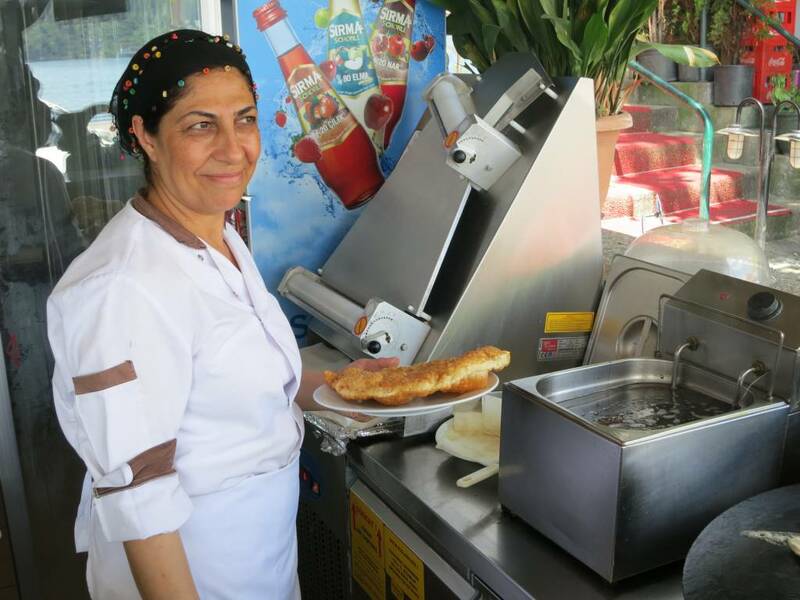 They ask me why I don’t serve in the evenings; well, there are friends and family to see, time to pause, until the next kofte tomorrow”. 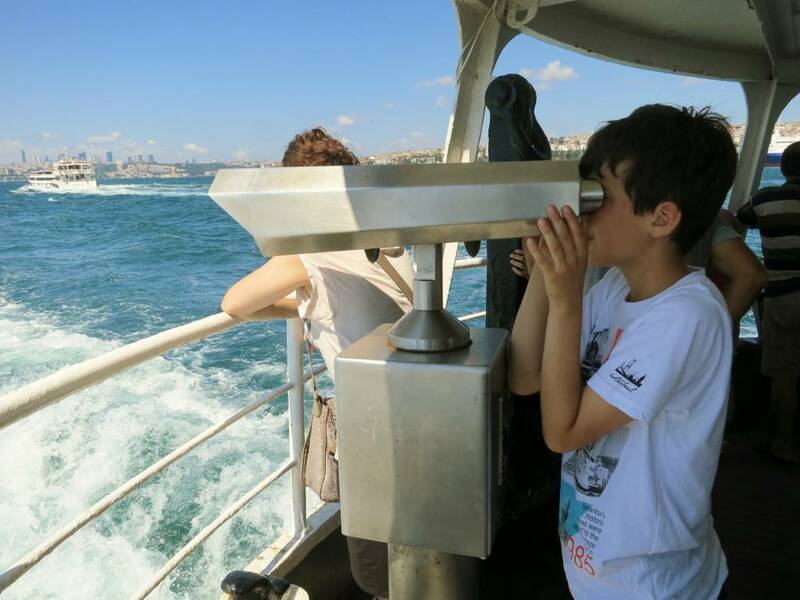 I liked his way of thinking. 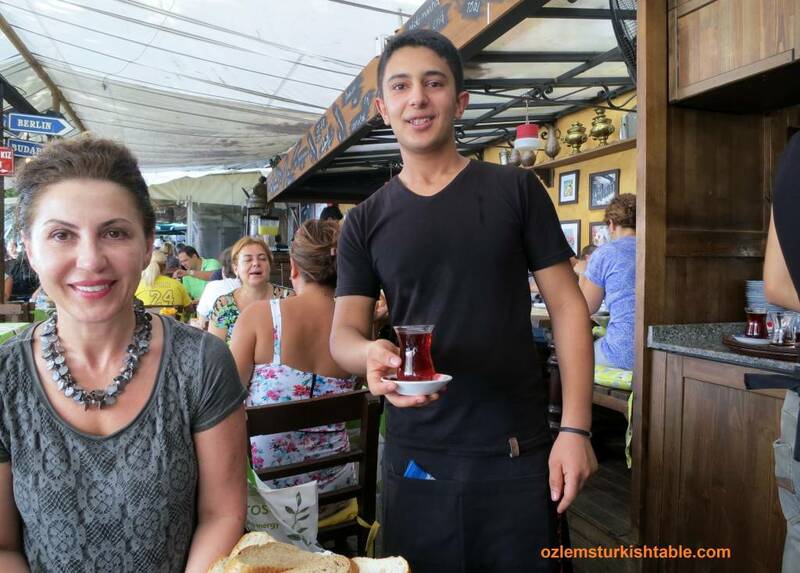 Chris especially wanted to know how they make the delicious tomato based sauce served next to the Turkish meatballs, koftes there. 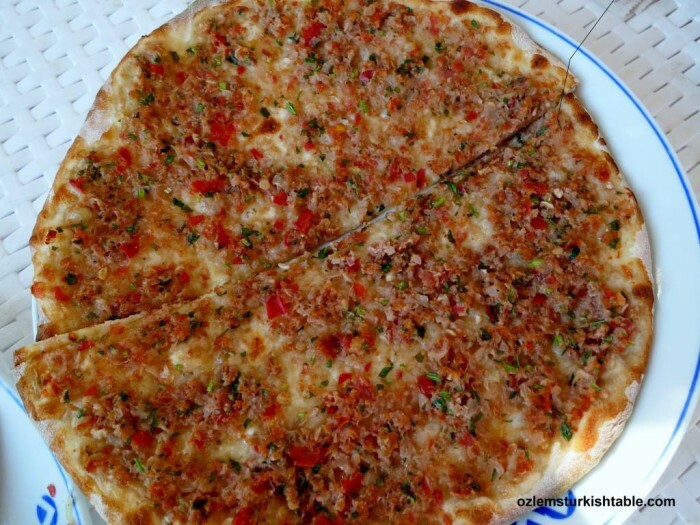 It’s a secret recipe apparently, though they revealed there’s crushed tomatoes and Turkish red pepper flakes, pul biber in it. 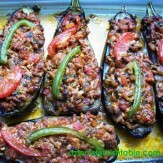 I have a feeling there’s also a touch of Biber Salcasi, Turkish hot pepper paste in the sauce, adding a spicy peppery flavor. 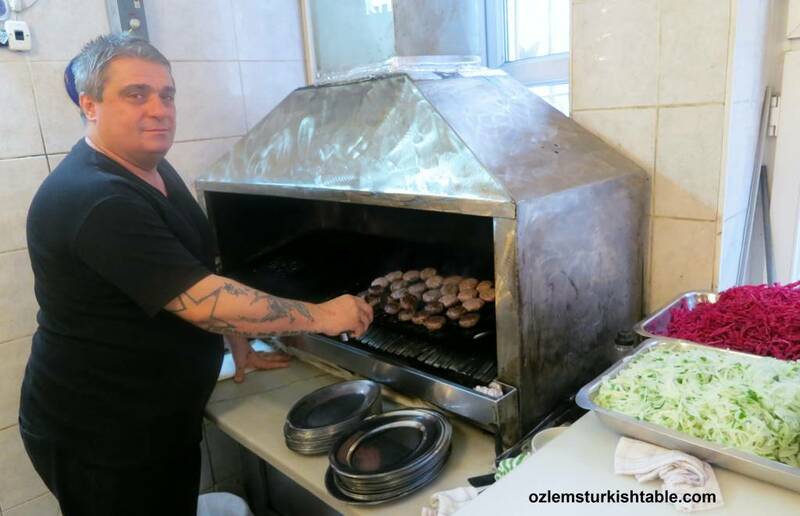 Kofteci Huseyin is a delightful, small kofteci if you happen to be at Beyoglu area and I am grateful that Chris asked me to investigate. 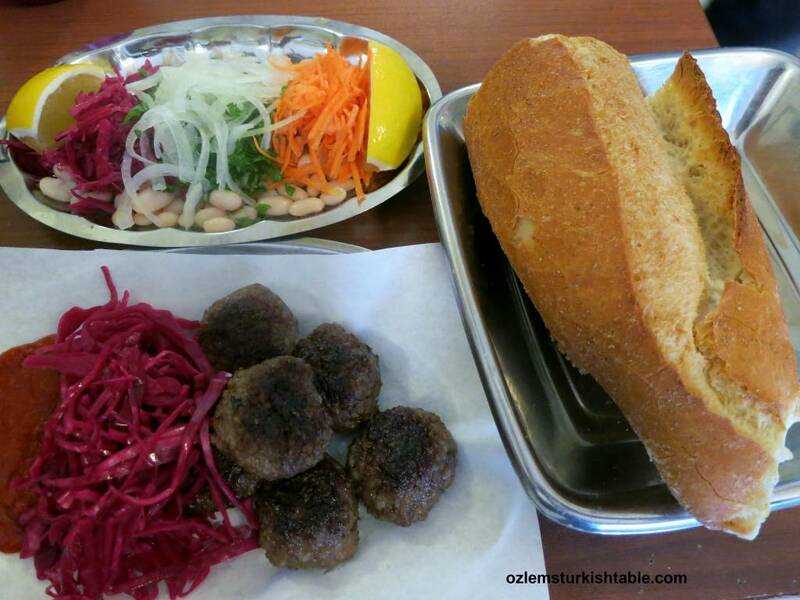 If you’d like to make kofte at home, here is my kofte, Turkish meatballs recipe 101. 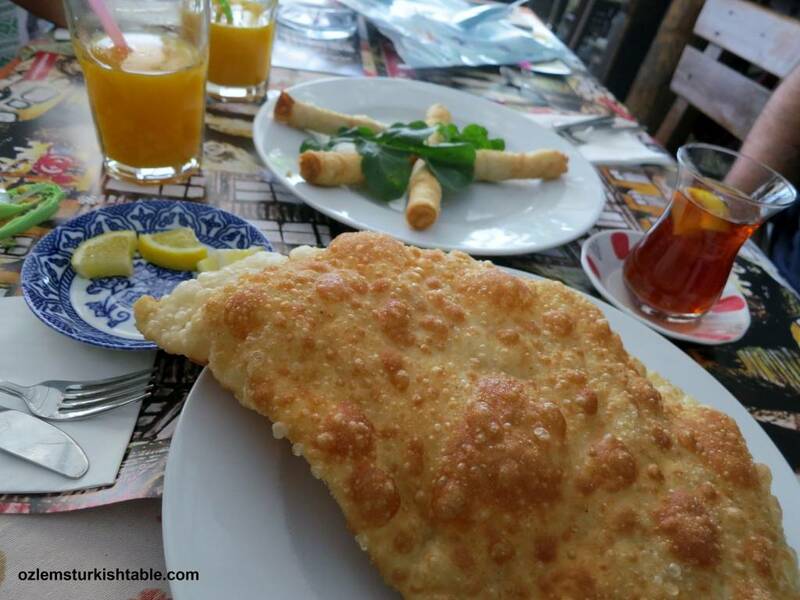 Meeting up with friends, Cicekten and Revan at Sahi Istanbul. 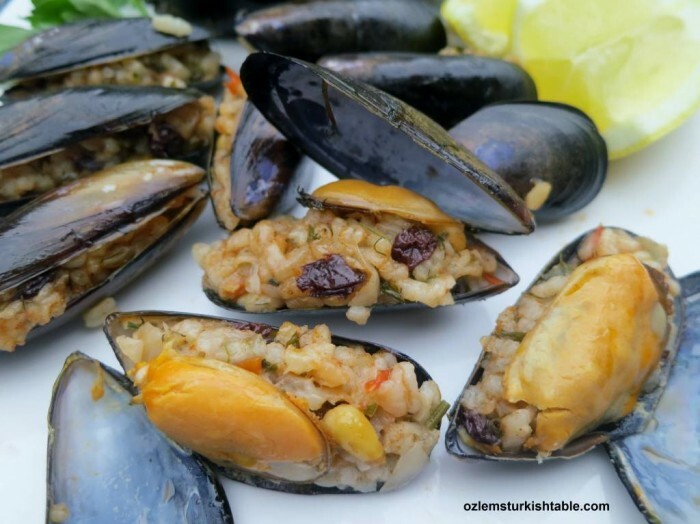 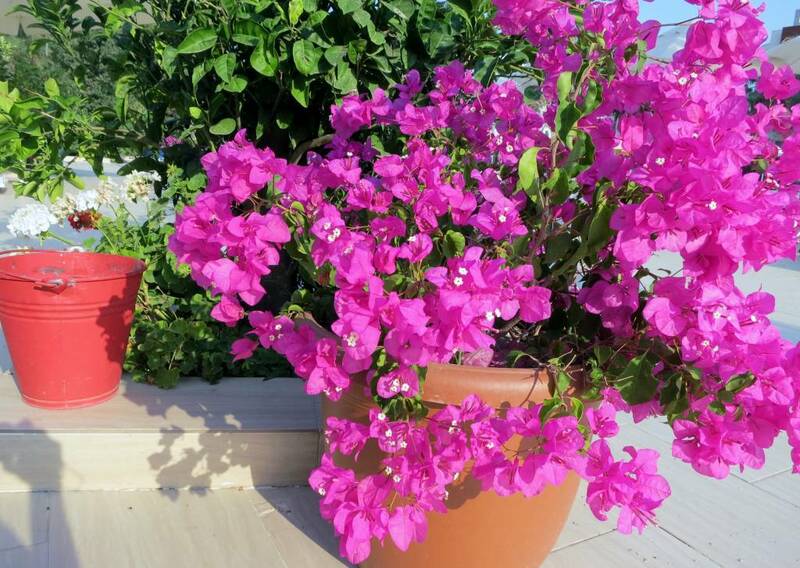 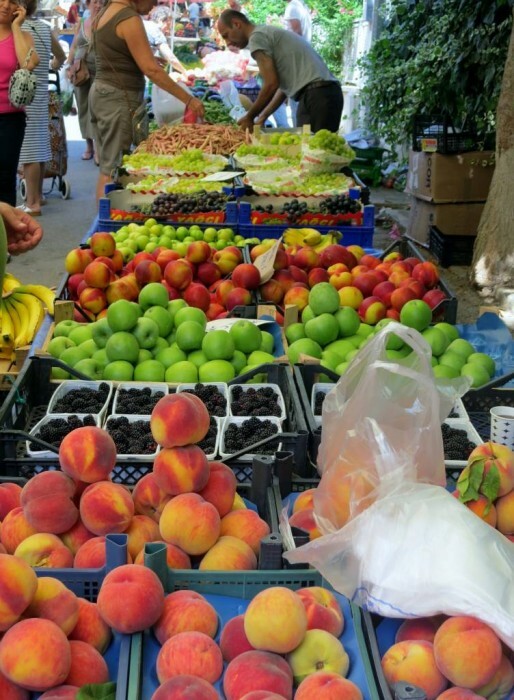 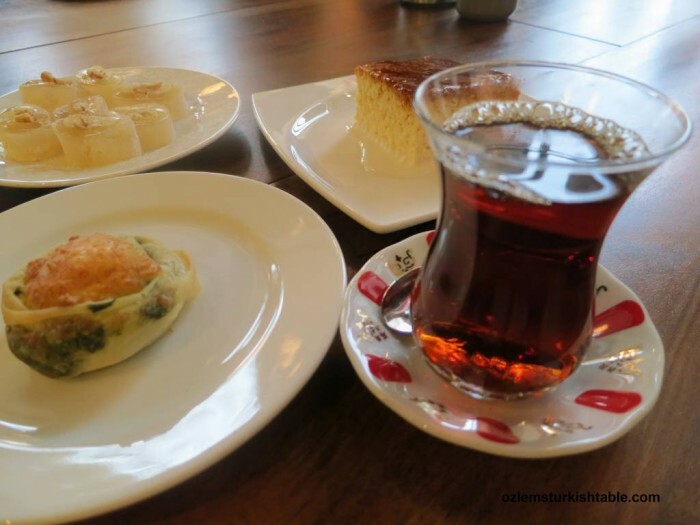 Have you discovered the beautiful Sahi Istanbul in Karakoy? 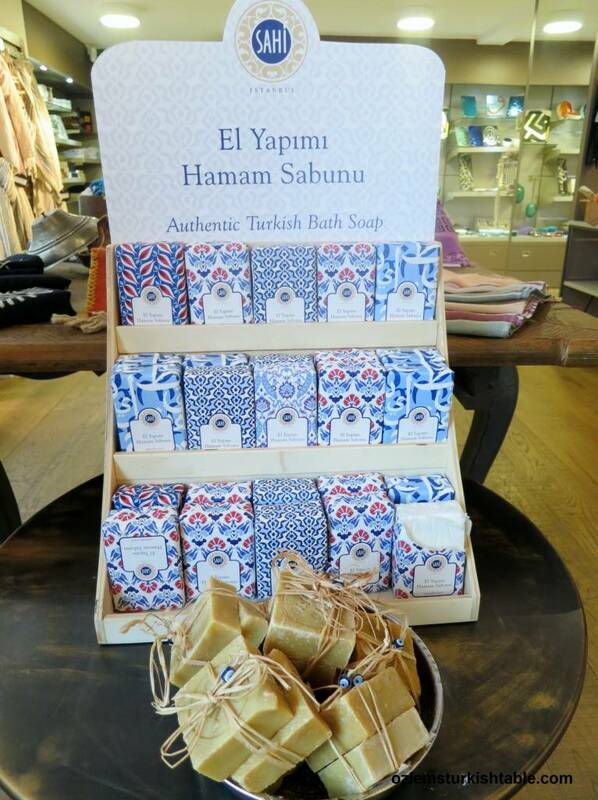 Founded by ex-colleague and dear friend Cicekten, Sahi Istanbul is home from home for me, offering the best of authentic , genuine Turkish design (as its name refers to), with traditional and contemporary objects, sourced from Turkish artisans all around Turkey. 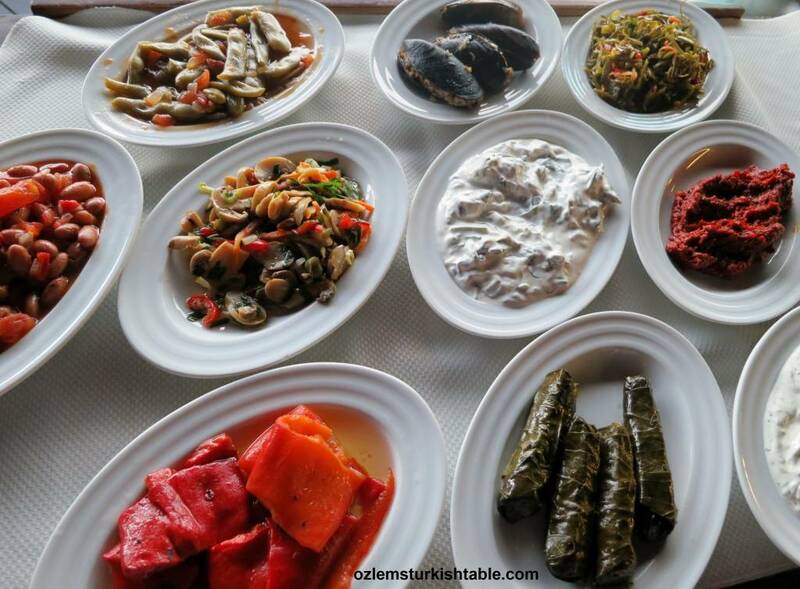 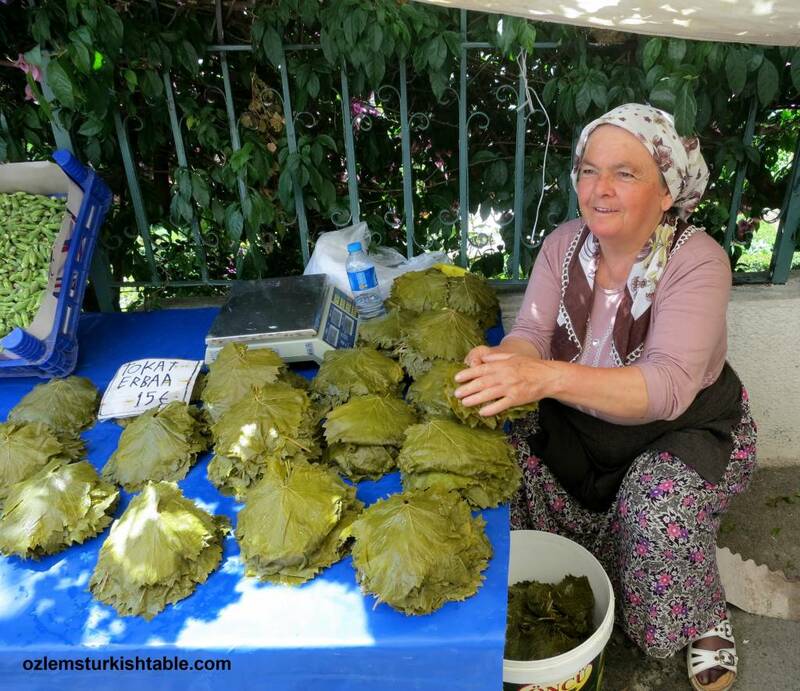 I love the beautiful hand decorated ceramics, locally sourced textiles and the authentic Turkish delights I long to taste there, whenever I am home. 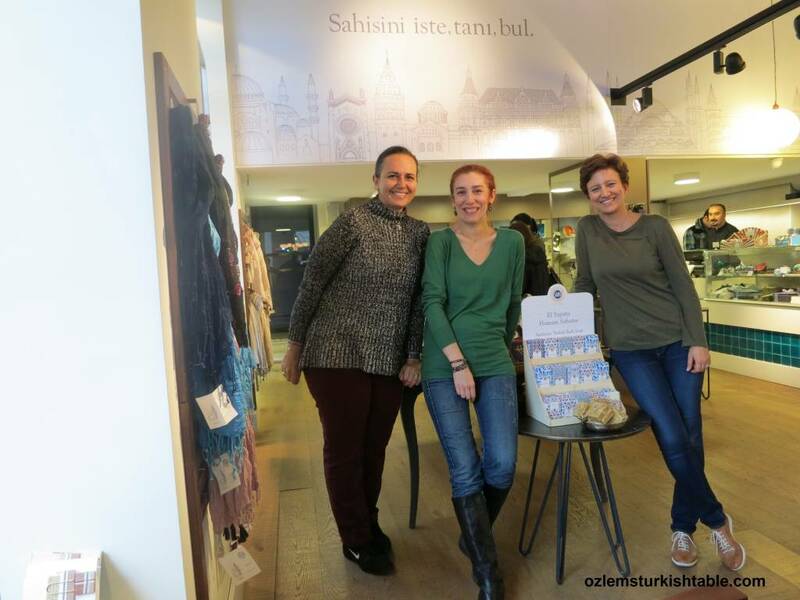 It was a delightful to stop by at Sahi Istanbul meeting with friends and Cicekten showered us with the best possible Turkish hospitality. 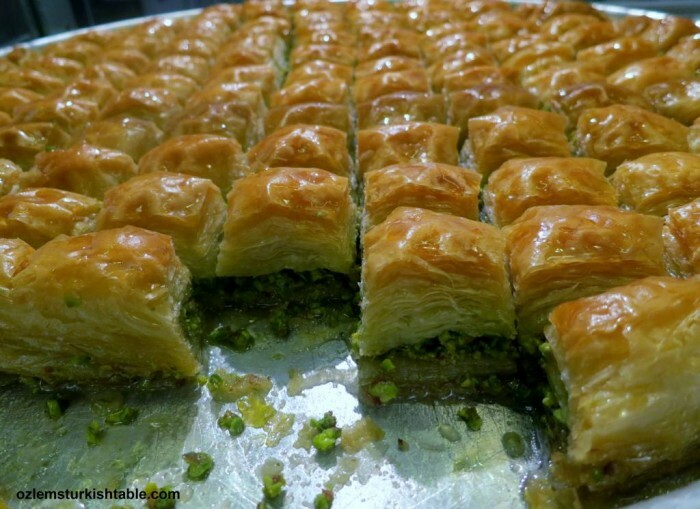 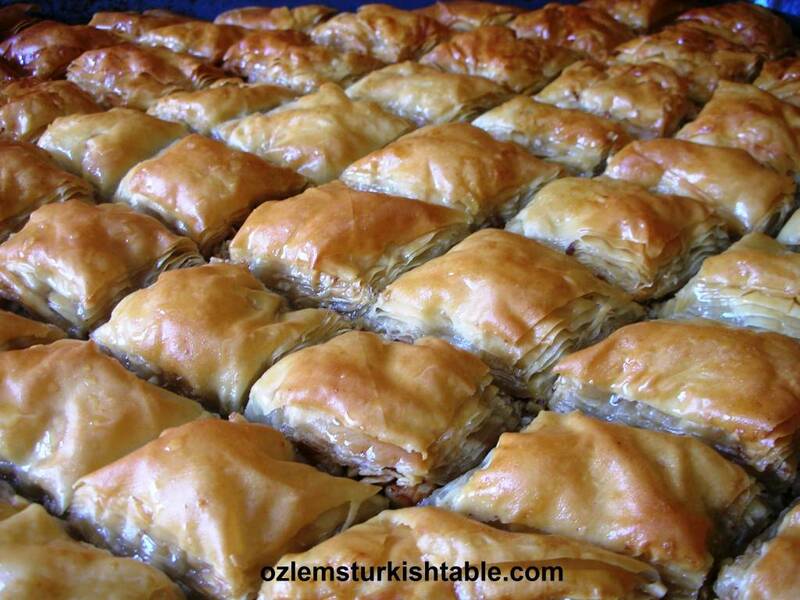 Irresistable baklava, the real thing from Gaziantep. 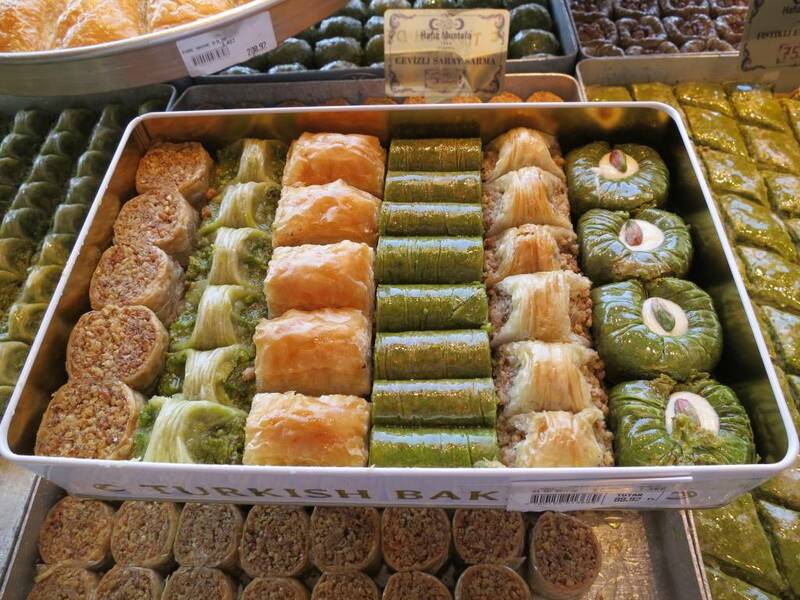 Homemade Turkish delights (which you can have a go at making them at Sahi Istanbul – Karakoy); scrumptious boreks, pastries and the original baklava sourced from Gaziantep; we washed them all down with endless glasses of Turkish tea, cay and chats. 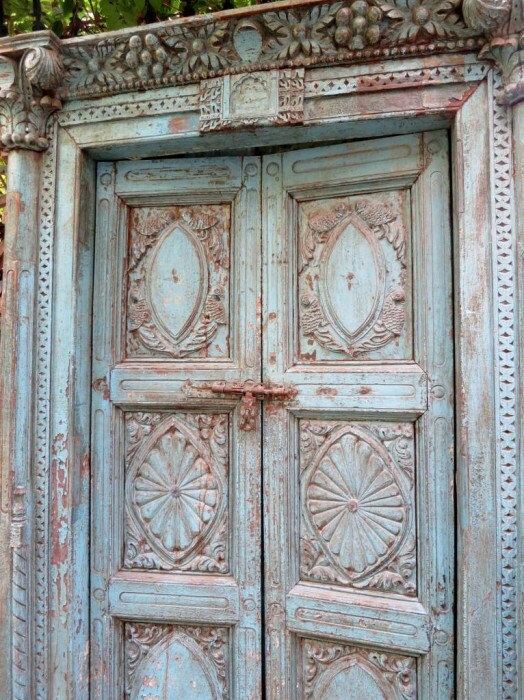 Please pay a visit to Sahi Istanbul if you can, you won’t be disappointed. 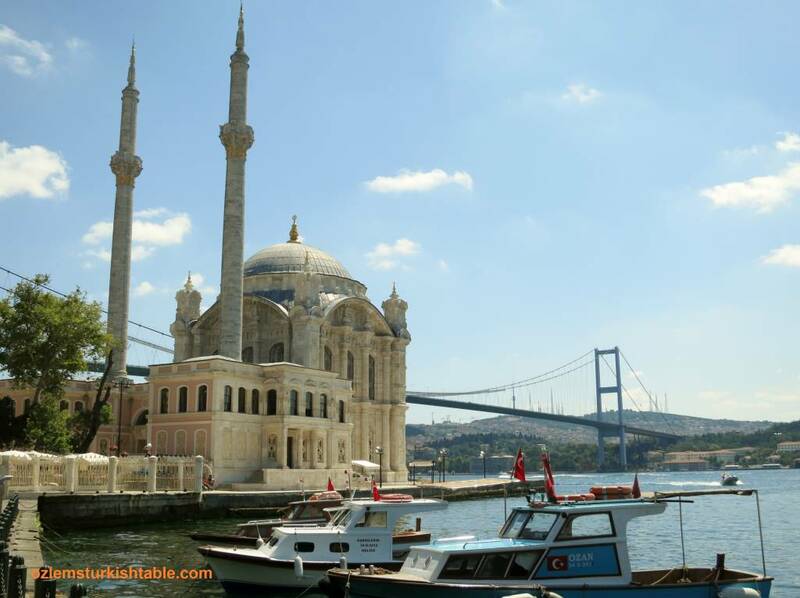 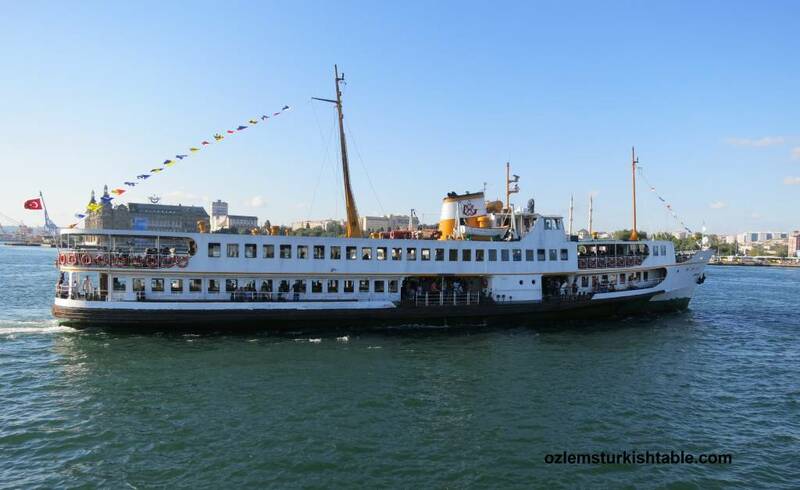 Sahi Istanbul’s website in English will also be available shortly. Sahi Istanbul also very generously gave away their authentic Turkish bracelets and Turkish homemade soaps for my Turkish cookery classes at the Central Market Cooking Schools in the US in February 2014. 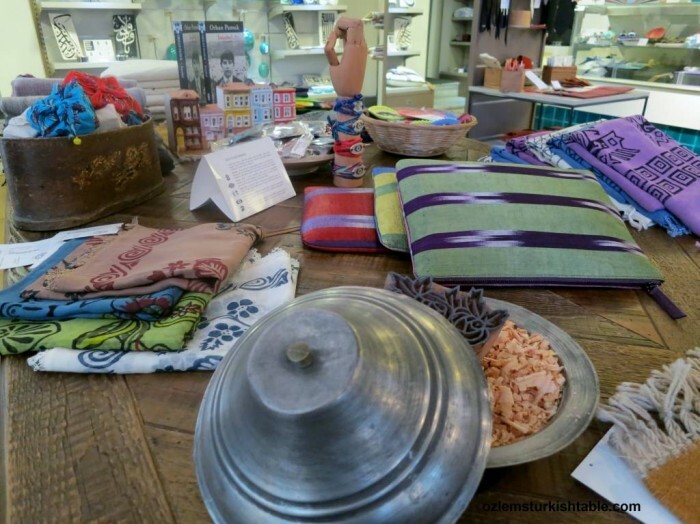 Special gifts to showcase Turkish crafts and hospitality, I am very grateful to their generosity. 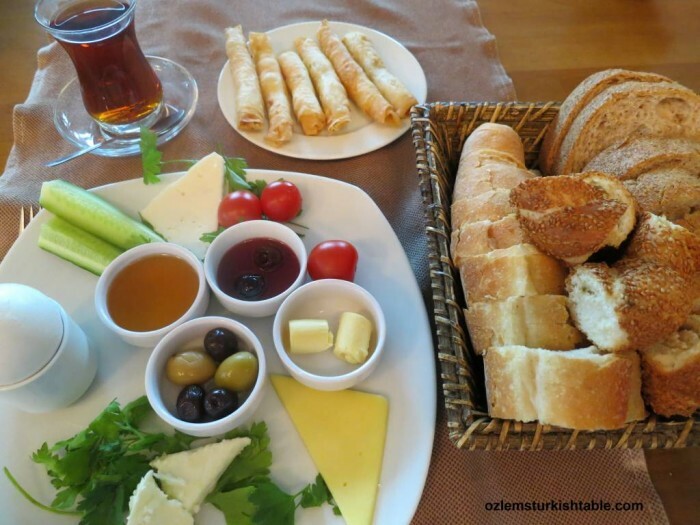 No visit to Turkey is complete without a leisurely Turkish breakfast with friends and family, my favorite meal of the day. 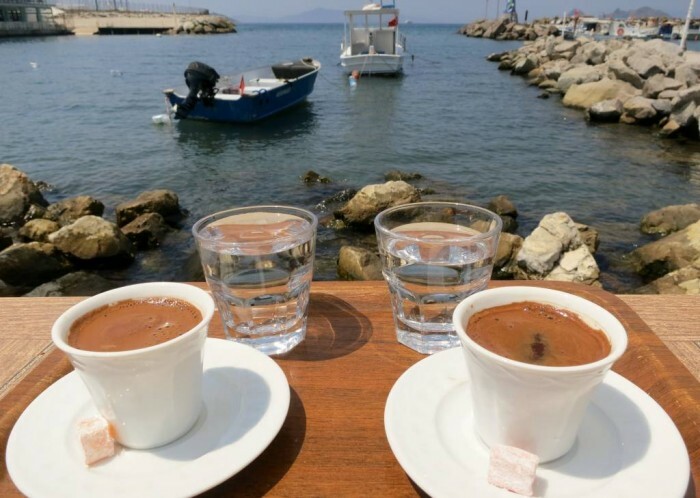 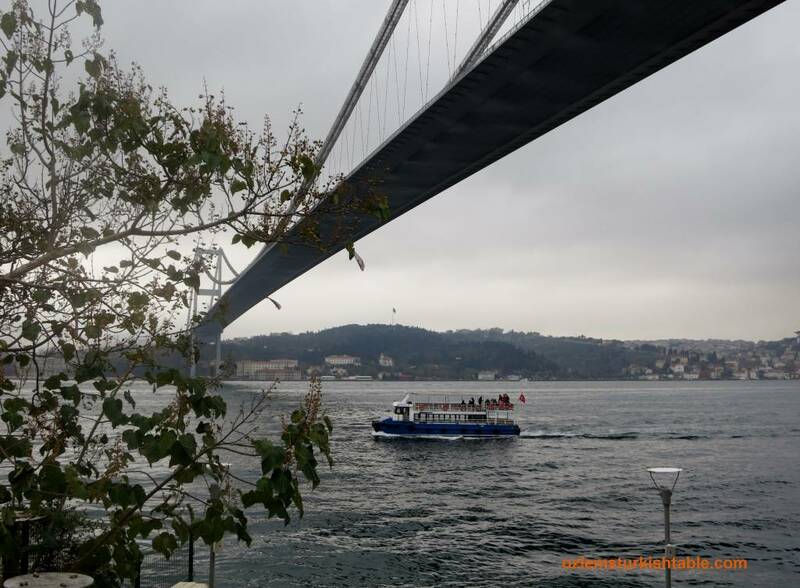 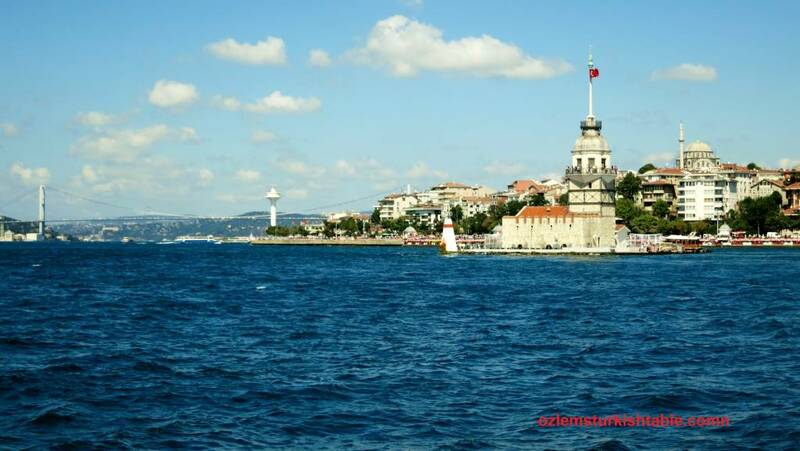 Just before our departure, we managed to sit at our local café by the Bosphorus with my parents, my sister and family and dear friends and fellow bloggers Senior Dogs Abroad. Senior Dogs live in Istanbul and blogs about life in Turkey (as well as world affairs) and I have been meaning to introduce them to my parents. My parents were delighted and so impressed with their Turkish and even more that they will be traveling to Eastern Turkey shortly. 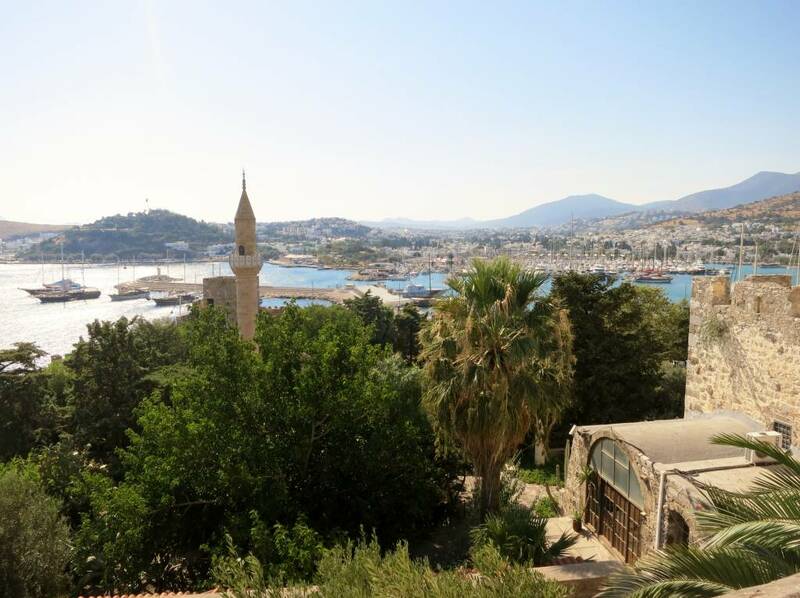 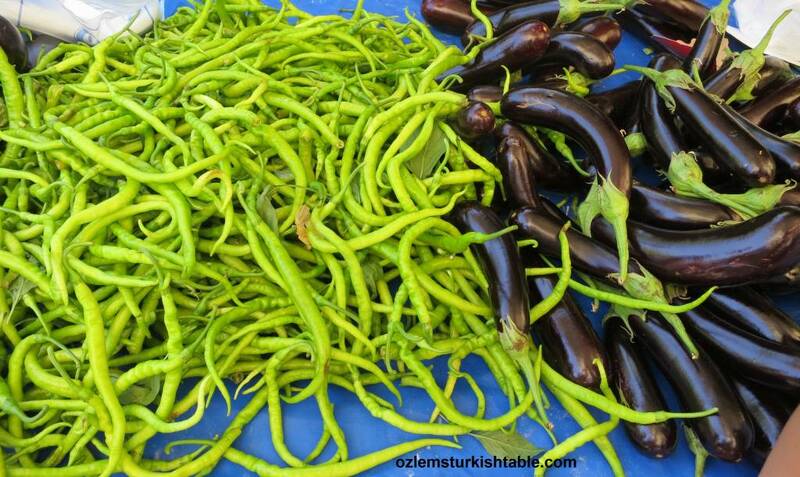 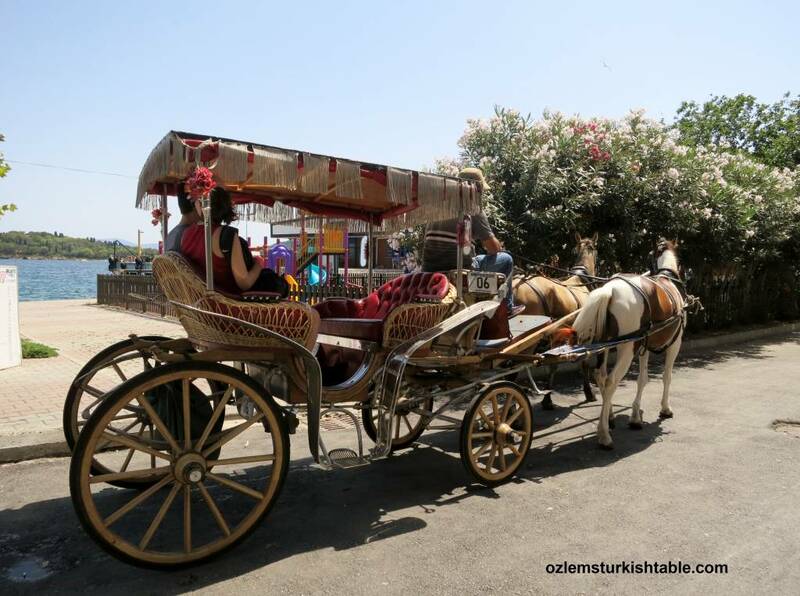 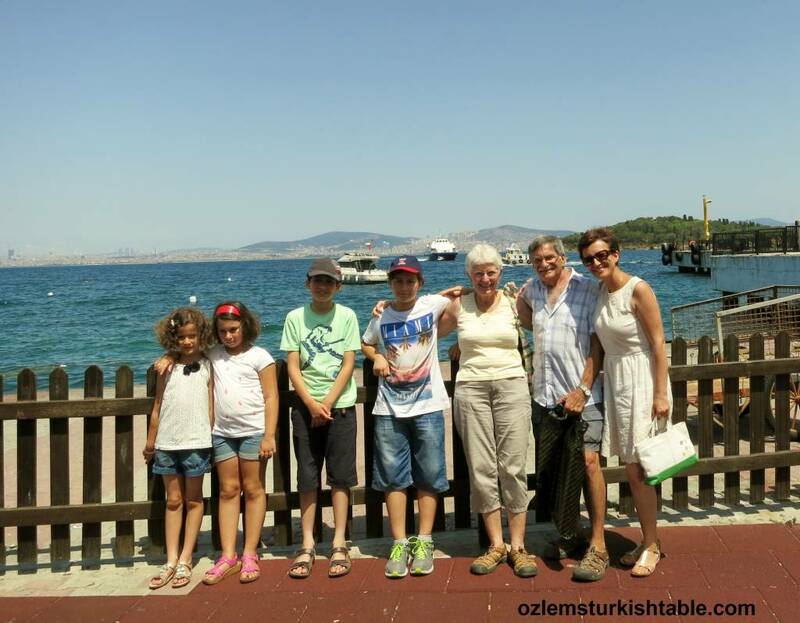 We lived in Elazig at the southeast of Turkey over 8 years when I was a child and my parents were eager to give as many tips as to where to visit- we all look forward to their adventures up there, not to be missed! 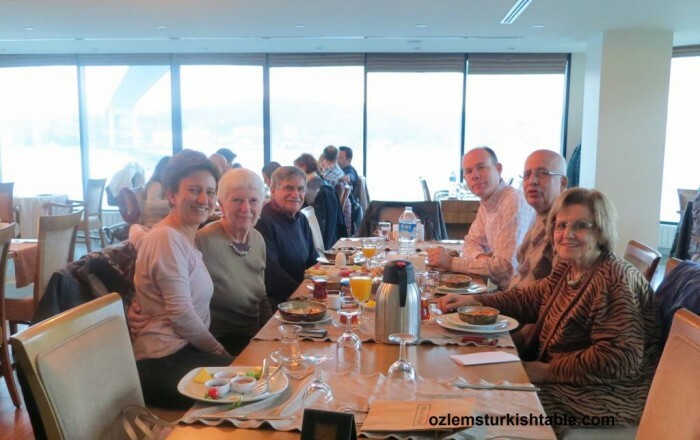 As always, it was a delightful few hours spent together with family and friends. 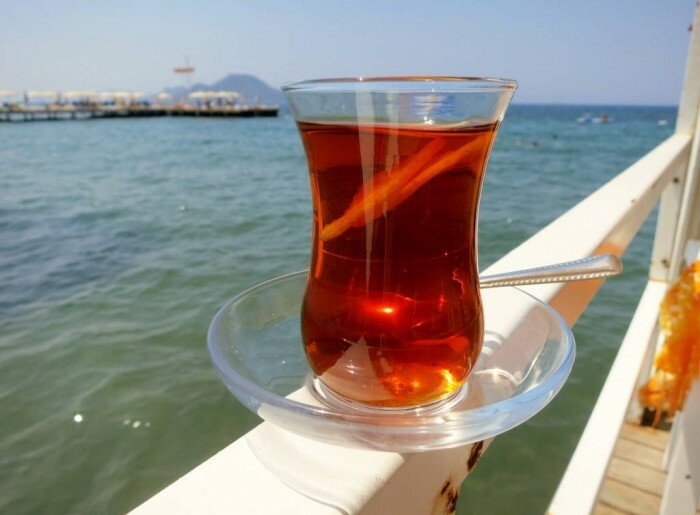 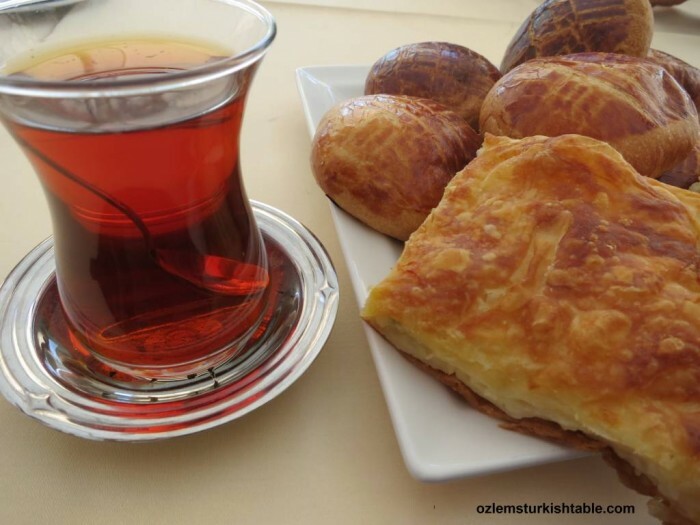 Turkish breakfast with a glass of cay; personal favorite. 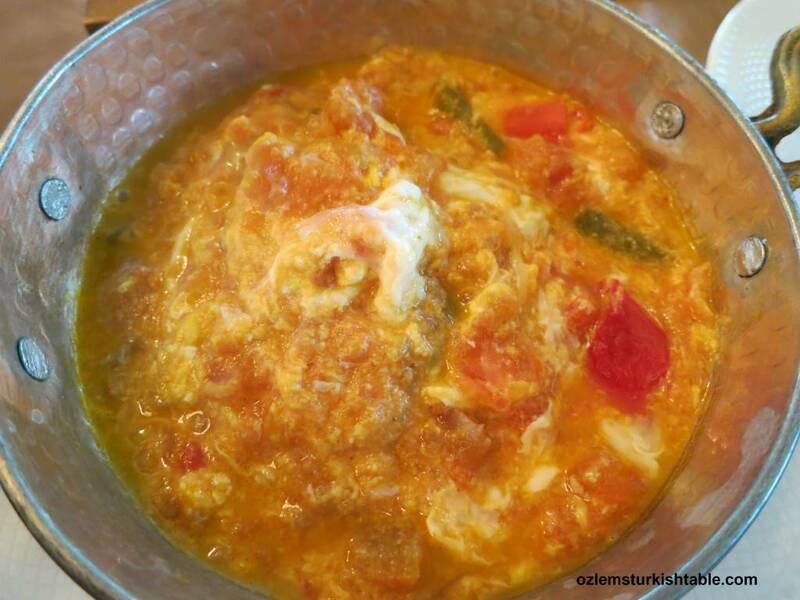 Menemen; Turkish style scrambled eggs with tomatoes and peppers. 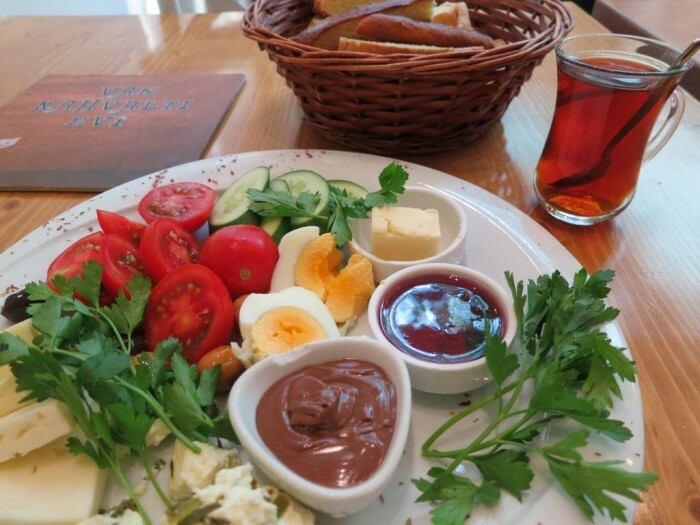 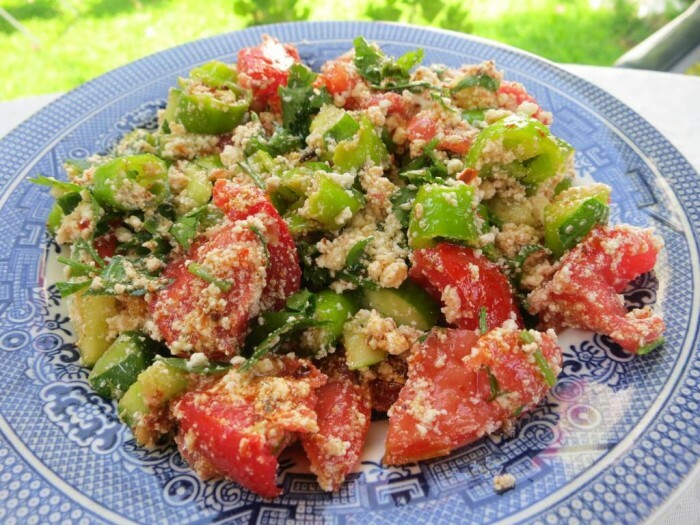 Menemen, Turkish style scrambled eggs with tomatoes and peppers is a favorite with us; delicious for a leisurely brunch or a light supper, it is so easy to make it at home too; here’s my recipe if you’d like to give it a go. 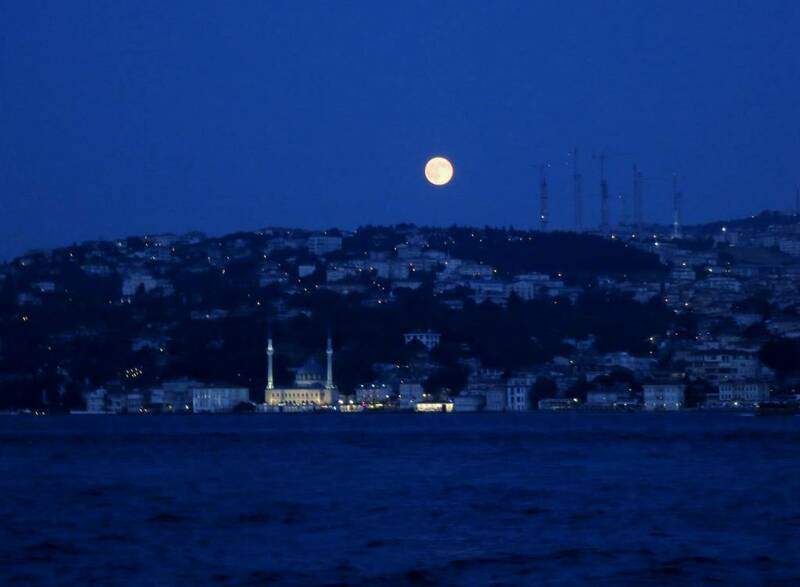 Time to say farewell and hope to see you soon, Istanbul; a special city that calls for us often. 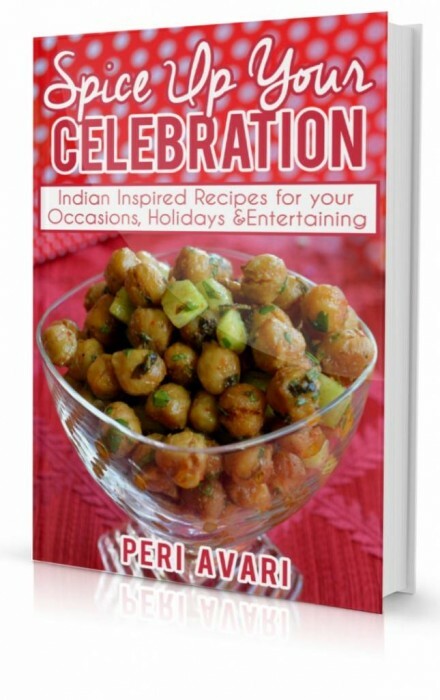 Peri’s Spice Ladle’s e-book, Spice Up Your Celebration is out now!! I really am delighted to see that dear friend and fellow blogger Peri’s Spice Ladle’s ebook, Spice Up Your Celebration; Indian Inspired recipes for Occasions, Holidays and Entertaining is out now! 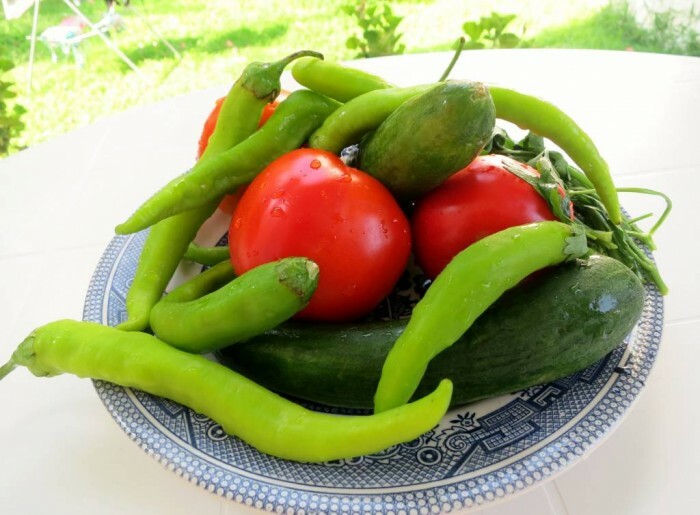 We have been enjoying Peri’s delicious and easy to follow Indian recipes for a long time and she really made me appreciate a variety of spices to incorporate our dishes through her wonderful, Indian inspired delicious recipes. 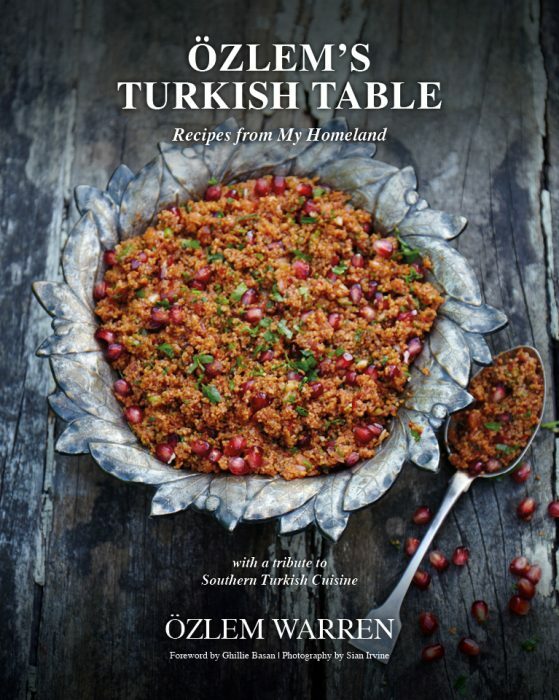 This gem of a book is a great source to make and enjoy delicious Indian cuisine in the comfort of your home; it’s a keeper in our home and I hope you enjoy it too. 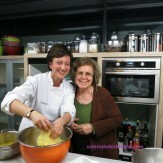 You can view the details of the Spice Up Your Celebration ebook through here. Enjoy!